Research Day : December 3rd! Posted on September 18, 2018 by noriko okamoto | Comments Off on Research Day : December 3rd! 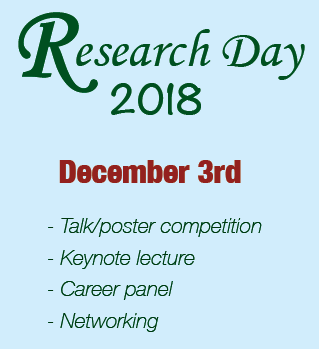 Research Day will be back on December 3rd, 2018! Research Day is a free one day conference for UBC postdocs organized by UBC PDA. We invite all the UBC postdocs to present their work in oral and poster presentation sessions (your chance to win prizes!). There will be a keynote lecture as well as a career panel session inviting reps from local companies as well as freshly started faculty to share their stories in advancing their career beyond postdoc phase. Registration will be open in October. For the most recent update, sign up to our newsletter and follow us on Twitter/Facebook! !